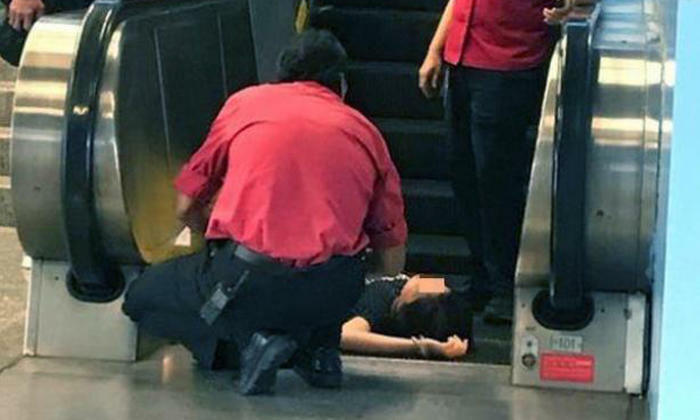 A woman in her 40s lost consciousness after falling down an escalator at Queenstown MRT Station on Saturday (Sep 16) at around 5.10pm. According to Shin Min Daily News, the woman was using the escalator to go downstairs from the train platform when the accident happened. When reporters visited the scene that same evening, a cleaner said that the woman was believed to have been using her phone while on the escalator. Not noticing that she had already reached the end of the escalator, the woman apparently slipped and fell. "Staff at the train station could not wake her, so they called the ambulance," said another witness. Another member of the public noted that the victim was unconscious and saw paramedics applying bandages to her head. The Singapore Civil Defence Force (SCDF) said the woman was sent to National University Hospital (NUH), which had been alerted to be on standby to receive her. Shin Min understands that the escalator was operating normally and did not experience any fault at the time of the incident. However, in the interest of public safety, use of the escalator has since been temporarily suspended. When reporters visited the location yesterday morning (Sep 17), the escalator had yet to resume operation. Maintenance notices that reminded the public not to use the escalator had also been put up at both ends. In a follow-up article, Shin Min Daily News said that the woman was trying to pick up her umbrella when she slipped and rolled down the escalator. The victim later contacted Shin Min to clarify that she had not been using her phone as a witness had earlier claimed. Instead, her phone was in her bag. Miss Liu, a 39-year-old engineer, said: "At that time, I was holding an umbrella, which dropped on the escalator. I was squatting down to pick it up when I fell. She recalled how she rolled down one or two steps before coming to a halt, knocking the back of her head in the process. The impact left her in a blur and although conscious, she was unable to speak normally.